Steve Garland, Katy Archer and myself ( Chrissy Partheni ) attended the conference. There was an excellent turn out ( 200 people ) and it was great to meet so many new people and catch up with old friends. The NWFED is keen to work closer with AIM and we are hoping that we can plan with them a future networking event. In challenging times an entrepreneurial approach is vital to achieve ‘resilience’ – that was the message from AIM’s annual conference held in Manchester last week. Reflected in AIM’s buoyant membership and its £930 million contribution to the economy it was clearly “the Age of the Independent”, said chairman Matthew Tanner in his keynote speech. Independents had shown through positivity and vibrancy that they would not be bowed by the economic downturn, and were constantly seeking new and creative ways to sustain themselves for the future. Independents were “delivering great museums and great experiences”, he said, becoming stronger at a time when it was all too easy to be knocked back. So it was not a question of ‘Keep Calm and Carry On’, but “Keep Calm and Bounce Back”. Sound financial management was imperative, he said, citing Mark Robinson’s Making Adaptive Resilience Real advice on Arts Council England’s (ACE) website. “Don’t do what you can’t afford to do, do what you can’t afford not to”. Bill Ferris, Chief Executive of Chatham Historic Dockyards Trust and Vice President of AIM gave an excellent presentation on the business model for success. This is how to get it right: be focused, know why you aim to make money, keep your vision on education and preservation strong, lead the team and let them develop,, people do business with people, enterneurship is a state of mind and is all about recognising oppportunities. Other tips included : know why you do events, what type of events and how much do they cost you, plan carefully, select the ones you are going to carry on doing, invest to improve and finally never stand still. Helen Field from The Fusiliers Museum talked with honesty about the challenges of creating a vision and a plan for your museum and how her previous commercial experience at Magna Science Centre helped her transform the service. Some of the steps she took included: clarifying the responsibilities and roles of staff, researching the audiences, encouraging new and repeated visits, revisiting pricing structures, introducing corporate events and hiring, charging for family history research, and working in collaboration with local attractions for marketing campaigns. Phil Gibby from the Arts Council defined resilience in terms of place, ideas and partnerships. He summed up the current challenges for museums and heritage centres as the following: what is the potential of your museum to build a new community/hub , how do you convert this to money without compromising your core values? The Arts Council has a role in linking up museums with other sectors; they may not have a lot of money but they has a lot of genuine will. Fiona Talbot from the HLF emphasised that the HLF is currently more willing to take risks as well as being keen to see organisations set themselves up in good financial basis. It was interesting to hear that the Digital Innovation fund has only received a handful of applications so one to look out for. They are also launching a fund for Collecting Cultures in December. 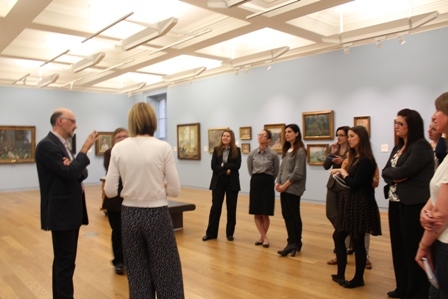 Particularly useful were also the presentations by Elaine Bentley ( Pallant House Gallery) on Legacy Giving and advice on how best to go about it. Reena Chityal ( London Transport Museum ) talked about the importance of planning carefully for e-commerce, accepting that there are no quick wins, investing for a return, creating an intuitive journey for your customer, keeping your offer unique, and refreshing your content. I also found the workshop by Chris Brown particularly useful and it was great to get ideas of how to make cafes fun and appealing to different customers. Visit Chris Brown’s blog www.greatcafes.blogspot.com for inspiration. The examples of Cogges by Judy Niner and of the transformation of the Arnos Vale Cemetery by Juliette Randall were also inspirational. The Smithy is set in what once was the village blacksmith shop in Eccleston, St Helens. The blacksmith shop was still functioning in the late 1970’s to early 80’s and many of its visitors today still remember Ellis who was the last blacksmith there. Eccleston parish Council purchased the building in 1995 and turned it into a local Heritage Centre. The permanent displays depict the trades that the building once carried out and temporary exhibitions change each year to keep catching everybody’s attention. Past exhibitions have included everything from mining to the ancient Greeks. Their latest venture is entitled ‘Images of War’ which is based around the most amazing collection of ex-MOD WW2 photographs. The exhibition was recently noticed by the people of St Georges Hall in Liverpool and the curators were asked to replicate it as part of series of events being held there for the Battle of the Atlantic celebrations. The Smithy is run on a budget of £600 so, therefore, need to be very creative and a little adventurous to keep on going. 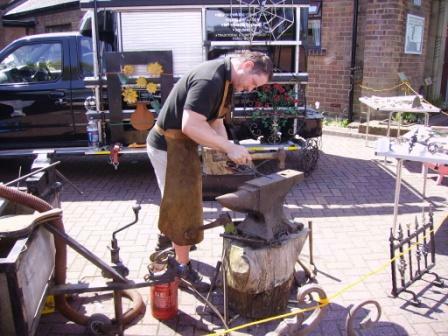 The team there have recently combined their regular International Blacksmith’s Day with a local beer and cider event along with a hog roast. This proved quite profitable and the proceeds can now go towards a restoration programme to consolidate and conserve the blacksmith shop. First of all thank you to Marcus Chase, Catherine Pank and Michael Whitworth for their excellent presentations on the challenges and opportunities of corporate events for museums and galleries. Their sincere account of how things are planned and executed and their responses to the delegates’ questions has made the event a success. Clarify the reasons why you are embarking on commercial operations and get the organisational buy in. If you are a public institution with a priority to public access and education, do not compromise that role. Work out a healthy balance. Start small, there is no point being over ambitious and stretching yourself too thin on the ground. Promote your unique selling point: fabulous art, impressive and historical buildings, gardens, quirky collections, temporary exhibitions. Think of how you may want to use different venues ( some more suitable for weddings, and other for product launches ). Work as a team with your collections specialists. If you intend to use actual gallery spaces give careful consideration to pest management. Plan well your organisational calendar, especially if you are a complex institution with many operations. Think of all the different spaces you could be using ( hall, galleries etc ) and go for different experiences and packages. Slice your building, be prepared to make different offers to clients. Number crunching and working out your profit is the mort important element in planning your commercial operations. Be brave: stop doing things that are not making you any money. Refresh your offer and your catering spaces, introduce appropriate collections in trading areas to have a more original feeling. Work with florists, light technicians that can help you dress up your spaces. For weddings your offer may include as many things as you can cover as possible to make it attractive to potential customers. Marcus,Catherine and Michael believe that having support networks for commercial operations in the region is extremely important and we are hoping to tap onto their expertise in the future for an event on perhaps catering and museum shops. It’s events like this that sum up the creativity and energy of our sector!